November first is Día de Todos Santos or All Saints Day, which is widely celebrated in Latin America (many Americans are familiar with the Mexican commemoration of this feast day, Día de los Muertos). This Catholic celebration holds special significance in Guatemala, and it is given as a national holiday. I took the opportunity to attend the kite festival in Sumpango. 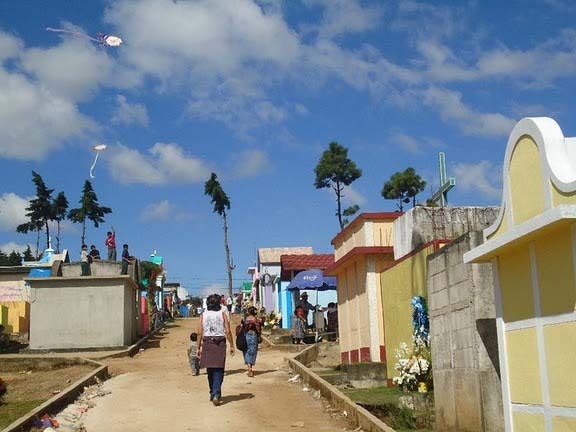 Along with Santiago, Sumpango is host to one of Guatemala’s two famous kite festivals. The kites, or barriletes, are made by groups, something akin to a fraternity. These groups are generally made of young men, but we did see a few women among the barrileteros. The planning and execution takes a full year. First, the group must decide the theme and elements of their kite. Then, the design is sketched out. 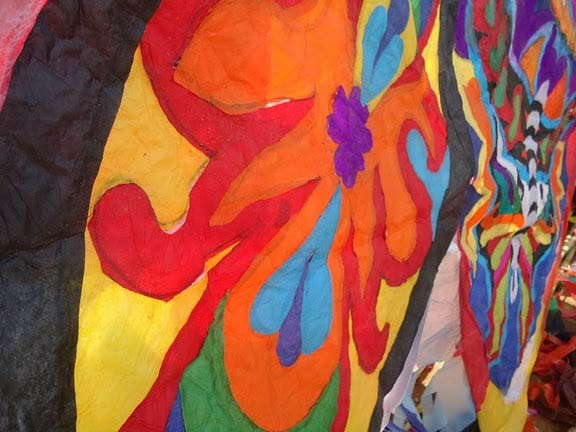 Thousands of tiny pieces of tissue paper are cut and glued together to create the front of the kite. 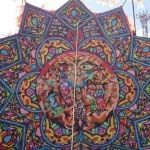 This meticulous process can take up to five months, as the kites are incredibly detailed. Meanwhile, bamboo is ordered and shipped from the coast for the frame. Once the design is finished, layers are added to the back to give the kite strength. All of this must be done under strict code of secrecy – the kite design is not to be revealed until the festival. A couple of friends and I clambered on the chicken bus and made our way to Sumpango. We passed Santiago along the way, and saw their towering 57-foot kites. You could see them from the road about a half-mile away. However, we were resolute in our decision to press on to Sumpango. Although the kites there are “only” 40 feet, they fly kites up to 26 feet across. This was a spectacle that must be seen! We finally arrived in Sumpango. The event was held on the soccer pitch, which sat atop a large hill. Coming up the hill, we saw hundreds of people flying brilliantly colored homemade kites that swirled in the breeze. As we wound our way further up, we passed grills loaded with roasting cobs of yellow and black corn, as well as carne asada and adobado. The sights and smells surrounding us were tantalizing. We finally pushed our way to the top and were instantly enraptured with the line up of prismatic kites. The sun was at the perfect angle to set them ablaze. The crowds milled through several lines of barriletes on exhibit, with short in front and tall in back. I marveled at the detail of the kites, and even more at the powerful messages that were conveyed in the designs. As we strolled through, we were fortunate enough to see several being erected. Watching the kites being carefully rolled out and attached to their bamboo frames before being cautiously erected gave me a very clear appreciation of how much work went into making them. When we reached the end of the line, we took another short path down to the cemetery. I have been to a number of cemeteries in Latin America, from Mérida to Buenos Aires, and I’m always stricken that they look so similar in form. Graves are generally cement tombs where up to 30 family members are buried together. Wealthy families often have grand mausoleums in the center of the cemetery, while the exterior wall is made of little cubby holes that poor families can rent to put their loved ones’ remains. 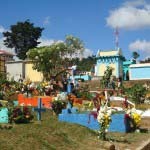 In Guatemala, Mayans often bury theirs straight in the ground, also on the margins of the cemetery. I was immediately in awe of the amazing colors of the cemetery in Sumpango – tombs were painted in brilliant shades, dazzling arrays of flowers were left for loved ones, and the giant barriletes were visible in the distance. My favorite moment was looking up to see boys flying kites on top of tombs. It is believed that All Saints Day is the day that souls are allowed to come back to Earth. The noise made by the kites serves to ward off bad spirits from returning, as it is said that the rattling scares them. It is also said that they bring messages from souls in purgatory up to heaven, which are hidden in the layers of the kite. This is a perfect example of the syncretism of indigenous religions with Catholicism that is prevalent across Latin America. The link between the barriletes and Mayan culture is most prevalent in the kites’ design. Each year, the kites are designed around a theme, which is always some sort of social commentary. This year, the unifying theme seemed to be preservation. All of the kites that I saw directly addressed either preservation of indigenous culture or the environment. Mayans believe that maintaining balance with the Earth is essential to life. Losing this balance leads to violence, which was depicted on several barriletes. 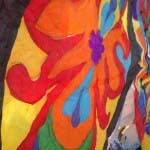 My favorite kite was ringed with intricate designs that looked like stained glass. However, it was the center scene that moved me. 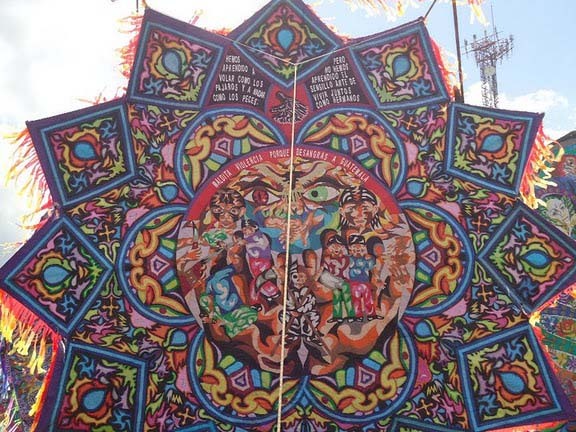 The kite depicted Guatemala’s vicious side, with gang members, members of the military and others guilty of death and violence. Above this scene was the message, “We have learned to fly like the birds and swim like the fish but we haven’t learned the simple art of living together as brothers.” Below this saying was a condemnation of violence. It sent shivers down my spine. Another was captioned “the wealth of our beloved Guatemala” and displayed Mayans in traditional clothing involved in agricultural tasks framed by Guatemalan fauna. After a second stroll through the barriletes, we took seats in the stands to watch the attempts to fly the big kites. Each group had two attempts to make their kite fly. The group members lined up on a huge rope, were given a signal and ran to launch the kite. Another member stood at the back and fed rope from an enormous coil if the wind caught the kite. 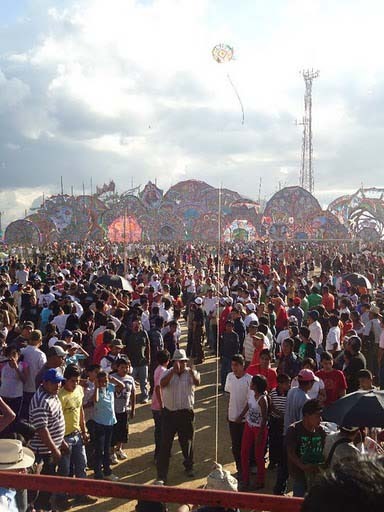 If the wind didn’t catch the kite, it would come spiraling down and crash on the campo, as the crowds scattered away. Each time a new group entered for their attempt, the campo would fill with people, who the announcers would fruitlessly try to clear from the field as the next group was preparing. At the end of the day, two large kites flew. One of them was the second kite in the lineup, hence, stayed aloft for hours. Shortly after the second was in the air, a helicopter flew overhead, making obvious their mammoth size. As the shadows began to grow longer, we boarded the chicken bus for home (of course, not until after we spent a half hour trying to figure out where best to station ourselves to flag one down before it became too packed). 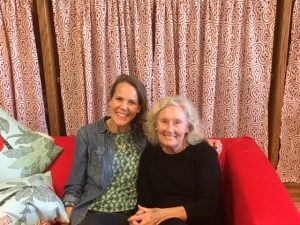 I was antsy to get back – there was fiambre waiting. 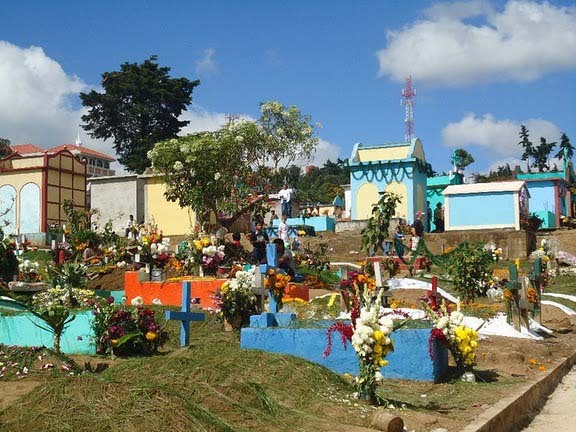 On Día de Los Santos, families would traditionally bring their relatives’ favorite dishes to their graves as an offering (I only noted flowers at the cemetery), and would have a picnic. Everyone shared what they brought, and eventually the fiambre, a mixture of lots of veggies and meat, was born. Each family’s recipe is different, and there are also some regional variations. The Antiguan fiambres that I have seen all featured intricately carved radishes placed on top. It is a sign of great trust and affection to be invited to eat fiambre. I was touched at the (delicious) honor. I take it as an incredible sign of progress to see this focus on preservation in Guatemala, in both senses. Everywhere you look in Guatemala, you see vehicles belching out thick black exhaust. It hangs in the air. I can only imagine the environmental degradation this causes. Even more, I’m delighted to see the focus on cultural preservation, and even pride in indigenous heritage. Guatemala had a devastating civil conflict that lasted for 36 years. A commission ruled it a genocide, which has been debated. Whatever you call it, the fact remains that 83% of the 200,000 people who died were Mayan. I take it as a hopeful sign toward progress and genuine inclusion. Celebrating our differences on a visible level like this, and with a craft that is so respected, is a huge step toward instilling a national mindset of respecting and honoring cultural differences. For Guatemala, a country whose form of ethnic cleansing ended less than 15 years ago, this is a meaningful step. This week, I saw peace in the “spirit” of the day.